Alison warned us that we’d really start to feel knackered by day three. She really wasn’t wrong. Bending over tables, concentrating more that we normally would in our day jobs and doing little fiddly jobs really start to take their toll on you after a while. 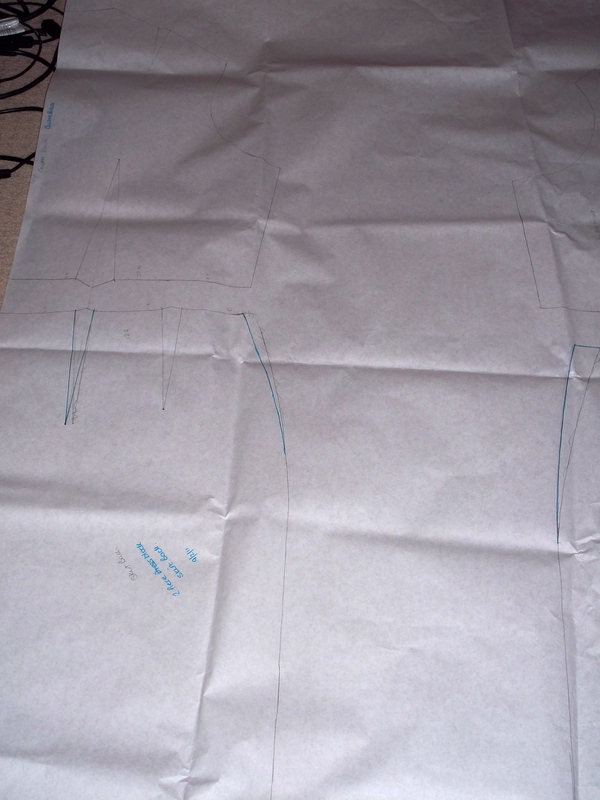 Regardless of how knackered any of us were feeling though, we soldiered on – especially when we knew we’d be creating dresses! 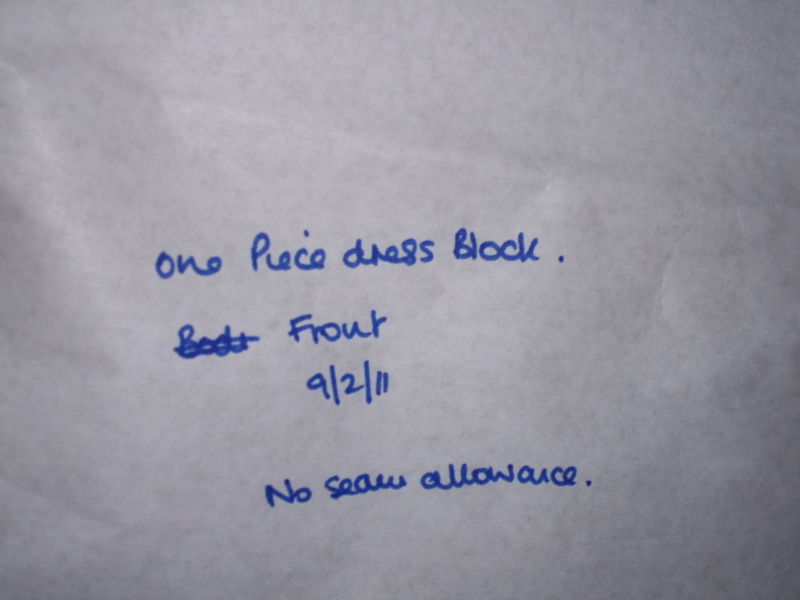 On day three we used our close fitting bodice blocks and our skirt blocks to create a one and a two piece dress block. The one peiece dress block is created from the skirt block and the bodice block, lined up and matched to create smooth lines. The dart points are aligned and redrawn as above. Next up was a two piece dress block. This rquired a little jigging around to make it work as well, which you can see better in these photos thanks to the blue lines, which mark the adjustments I made. You can see on this block (this terribly folded block) the blue lines that were used to mark any changes that we made to make it work. On the left hand side you will notice the original dart that has been scribbled out and the new dart drawn in (in blue). It’s important that, in a dress, the points of the darts at your hip and at the bust are aligned. 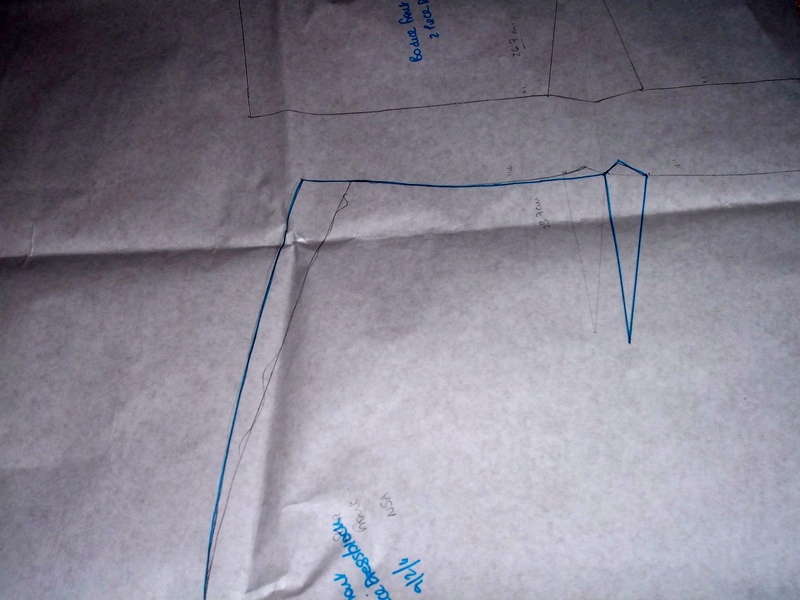 When you draw your two piece block (from your cardboard master copies) move the hip dart to make sure the apexes of the darts are aligned, then redraw the curve of your waist (as above) to make sure the edges of the two pieces will correctly match up when sewn together. Making up something from our dress block was the next thing on the agenda (after lunch, of course! ), to check that they fit! We had brought in photos as inspiration for the designs we would be making up. 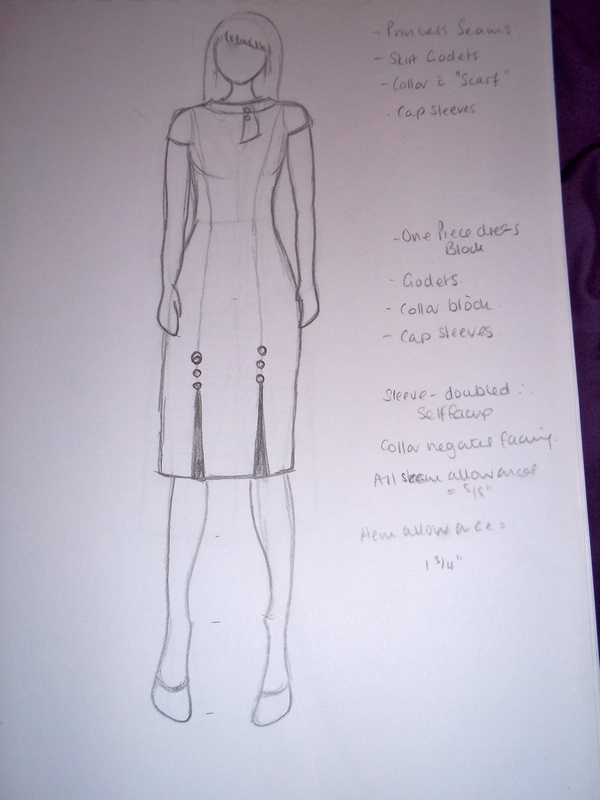 I chose a gorgeous Stop Staring dress as my inspiration (This one in fact) but I changed the neckline a little. Unfortunately, I don’t have any photos of it, but here is essentially what I did. A few people kept forgetting and getting really annoyed! 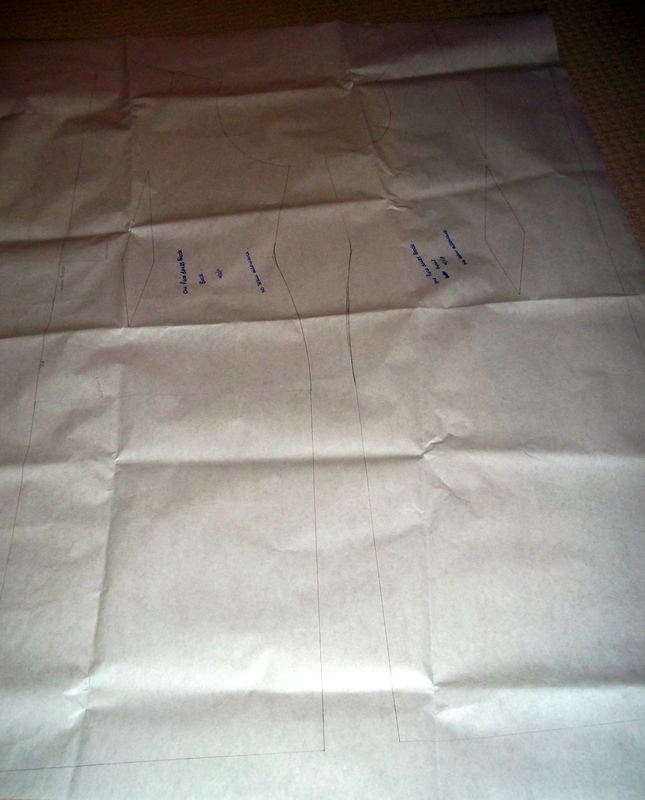 Alison also showed me how to create the godets to go into the seam to create that flash of colour when I walk. Making up the dresses also allowed us to ask Alison to show us any other techniques we wanted to know. Well, my dress fit great and got a good reaction from the other girls there so I now have my own pattern for a Stop Staring-esque dress! 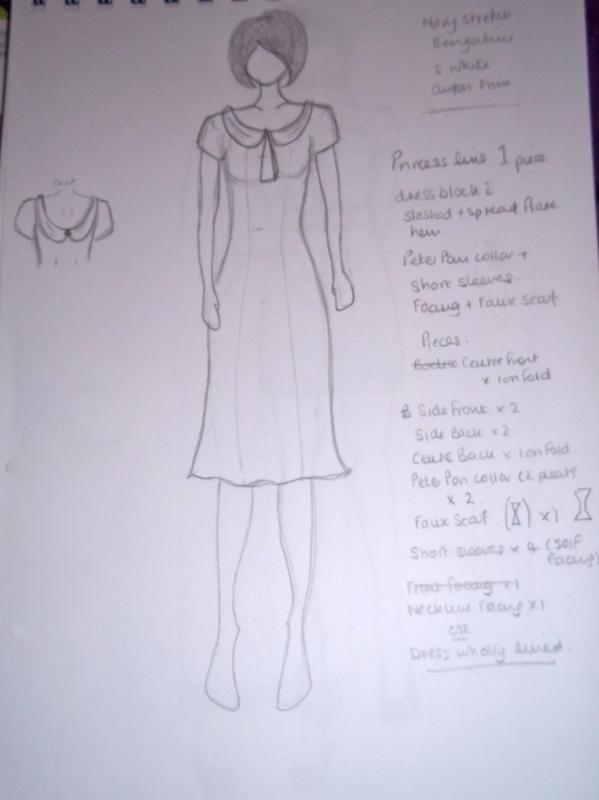 That’s all we did for day three – home to rest after, a nice big cup of tea and some more dress designs (and the realisation that I’m really not an artist…)! You draw a whole heap better than I do! You should see the first few fashion figures I ever attempted. Like lizard women, they were! 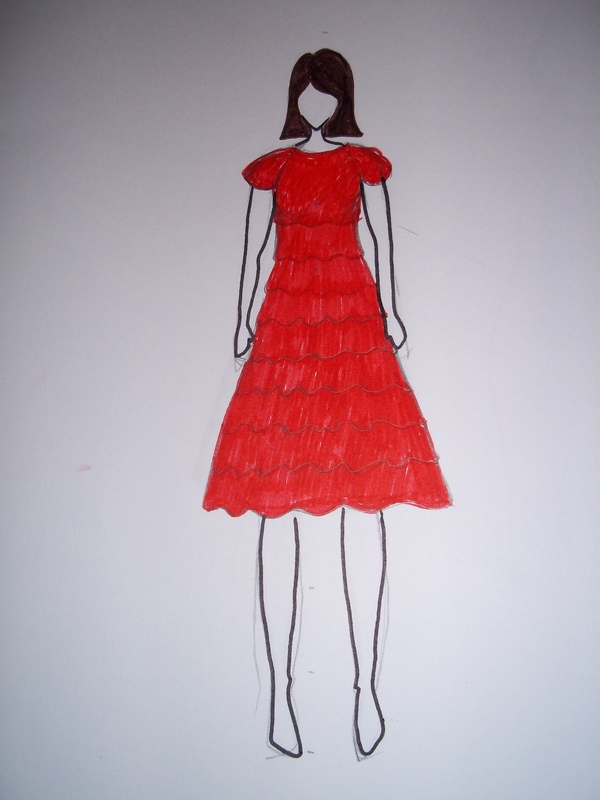 That red dress is actually one of the first few I manages to get right! It’s based on a bautiful layered Shabby Apple dress that I can’t justify buying and paying import tax on! I actually ended up buying “Fashion Artist – Drawing Techniques to Portfolio Presentation” which has been really good! There are instructions for different poses and for drawing faces etc (I am so terrible at getting the proportions right, which is why none of mine have them!). If you want to get into drawing fashion figures I’d recommend it, definitely! Aww thank you! I’m definitely going to make it up. I’m thinking either red with white godets and white with red polka dot buttons or black with red godets and red buttons. Or maybe both! 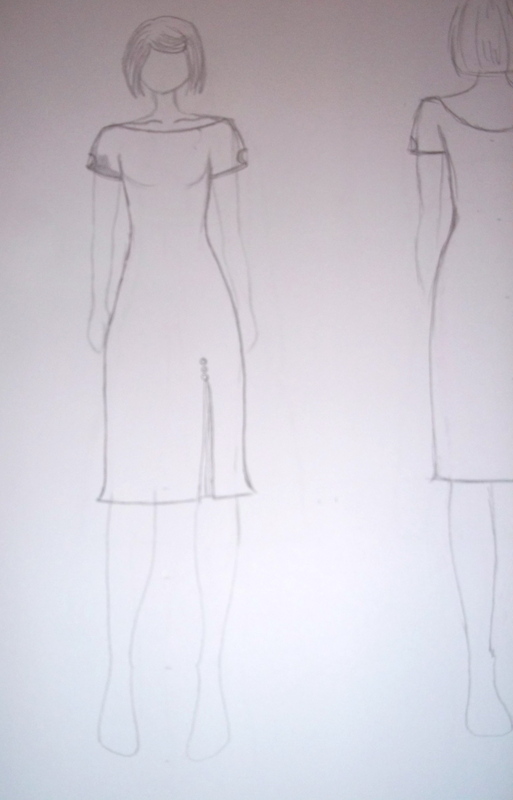 That one that’s quite plain with the front and back view I’m going to make up in navy and white with a navy chiffon collar. It’s so nice to get excited about this again! It feels like forever since i did the course and I’d almost forgotten all the stuff I learned. Ridiculous really! Oh, and do you want to borrow that book? I can bring it the next time I see you if you’d like? Just let me know! You put forward a good argument Mrs Tweedie!